Even the most delicate barrier between bikes and auto traffic can change the behavior of drivers and make cycling a lot more appealing. Case in point: An ingenious bit of tactical urbanism in Boston this week resulted in a bike lane protected by $6 pots of hardware store mums. 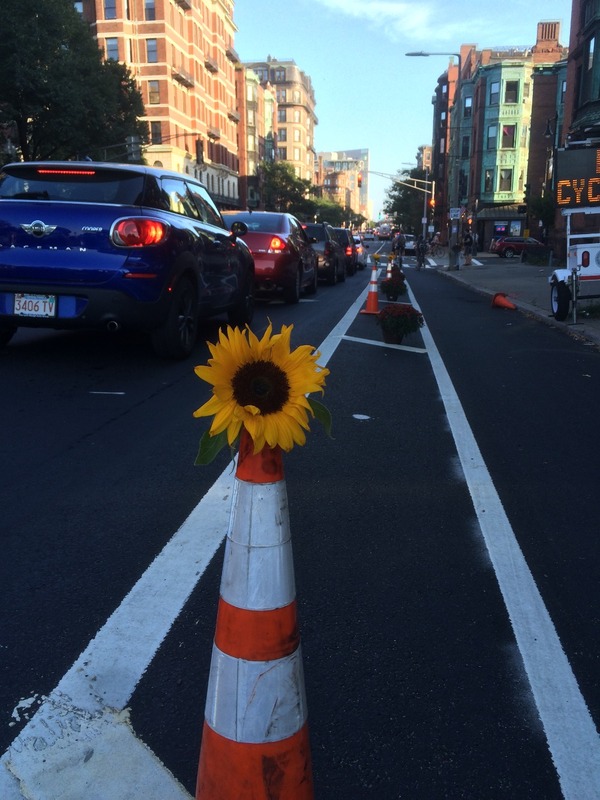 Jonathan Fertig told Streetsblog he was upset the city had striped bike lanes on Massachusetts Avenue, near where a truck driver killed surgeon Anita Kurmann in August, but hadn’t yet installed flexible posts that would prevent drivers from parking in the lane. So he took matters into his own hands Sunday by adding a row of potted mums, an idea he says he cribbed from the “Tactical Urbanism” manual written by Mike Lydon and Anthony Garcia. Amazingly, the plants remained in place and untouched for several days, until the city returned this week to install the posts. “The tops of the flex posts are open, so I’m actually planning to put a bouquet of flowers in each one on my way home as a statement that I’m still here, and that honestly I’m not satisfied with the city’s solution at this intersection,” Fertig said, adding that he’d like to see a more substantial protective barrier at the site. Fertig followed up his flower pot coup with these random orange-cone curb bumpouts this week. 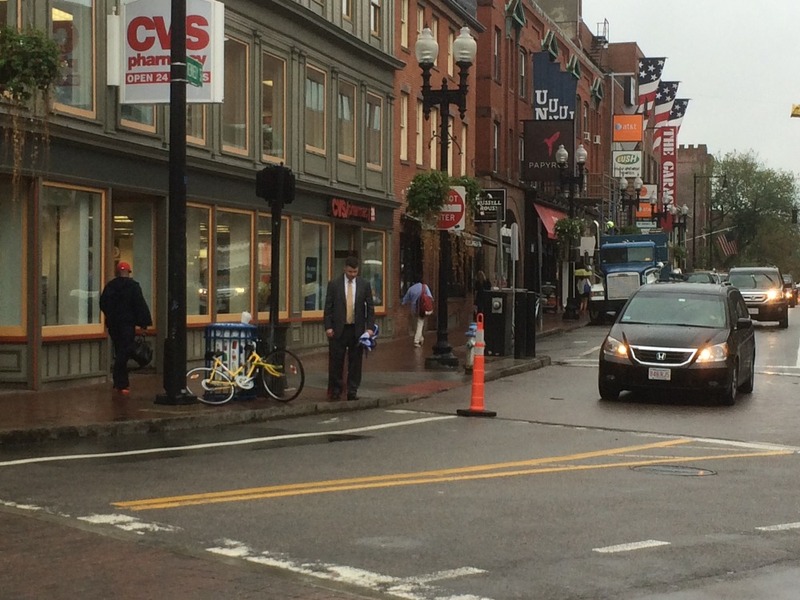 Meanwhile, Fertig’s efforts caught the attention of the Boston Globe, which published a surprisingly sympathetic story that put the city on the defensive over the delay in adding protective bollards. Fertig used the platform to announce a GoFundMe campaign to raise money for future interventions of the same type. The campaign has raised more than $3,200 in just two days. Fertig has used some of the money on projects like using orange cones as temporary curb extensions [pictured at right]. He said he simply dropped the cones on his way to work. Given the large amount of money raised so far, Fertig said he might explore more comprehensive tactical urbanism projects, like a Better Block demonstration. Isn’t that a sunflower, not a mum? In any event, great idea. Will Vehicular Cyclists and the “Right to Park” Trump Safer Streets in Boston? Vote in our annual Streetsie Awards and judge the highs and lows of 2017. Protected bike lanes. Protected intersections. They're all included in the draft version of the American Association of State Highway and Transportation Officials' new engineering manual.